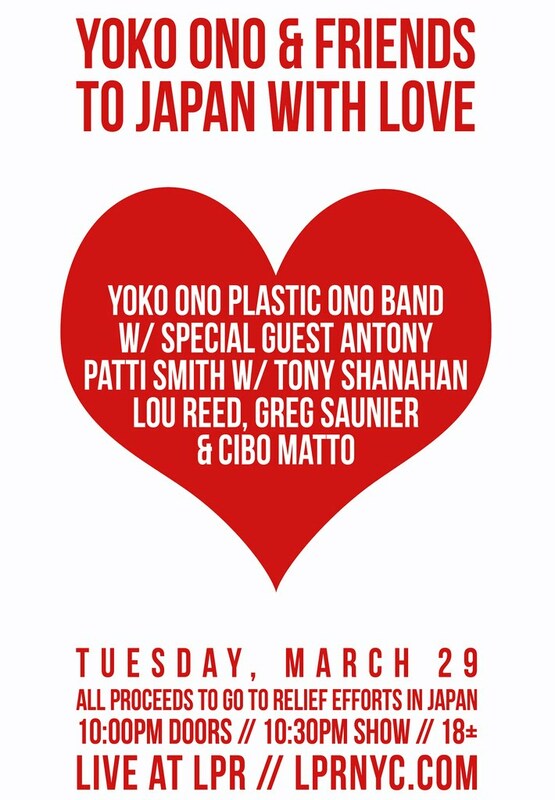 Yoko Ono and Sean Lennon held two benefit concerts for Japan this week, pulling many of their famous friends together to join their Plastic Ono Band. Over two nights $100,000 was raised for Japanese earthquake relief. The first gig was at Columbia University on March 27th. The second one was really special. As I entered the tiny venue, Le Poisson Rouge on Bleecker Street, I remembered all the amazing times that I’ve seen Yoko’s concerts, exhibits and lectures over the years, and that John Lennon was always right. The sold-out intimate venue held 700 people quite warmly. The immense tangle of wires on the stage was evidence that this would be a very interesting evening! Opening was Cibo Matto, the hip-hop/jazz/funk Japanese chicks whose delicious food-obsessive tunes feature all kinds of weird delicacies. Yuka Honda, Miho Hatori and Sean Lennon reunited their band after ten years. Their four-song set included ‘Sugar Water’, ‘Aguas de Marco’, ‘Beef Jerky’ and ‘Birthday Cake’! We bopped to their beats and insane recipes; ‘Extra sugar, extra salt, extra oil and MSG!’ They were joined by horn players and an increasing number of participants, including Honda’s husband Nels Cline of Wilco. Sean announced, ‘Yoko Ono has entered the building!’ Within seconds, she appeared, singing ‘It Happened’ acapella. Although the song was written so long ago, it has recurring relevance at tragic times in Yoko’s life, and also in the state of the world. Her delicate singing abruptly morphed into screams of terror and convulsions, transforming into a song of redemption, ‘Calling’ from her latest album. Ono also performed the hopeful ‘Rising’, the incredible blues jam ‘It’s Been Very Hard’ and my favourite – ‘Why?’ – an intense rocker featuring a free form guitar/vocal duet between Sean and Yoko, that is eerily similar to the John & Yoko version. Sean’s array of guitar pedals was astounding, and he utilized every one of them, especially the fuzz box! His girlfriend Kemp Muhl played bass all night. Greg Saunier from Deerhoof was on drums just for this song. Yoko wanted to perform ‘I Love You Earth’ (from Starpeace 1985) because ‘the earth is angry now and needs to hear it’. Yoko allowed Antony Hegarty (who praised the song’s lyrics as pure punk) to sing this one, but then the two of them got into an I-Love-You fest that just wouldn’t quit. Sean introduced the final song as a great one written by Neil Diamond…it was his dad’s ‘Give Peace A Chance’. The sky is cracked now above Japan.